Will the demonetization policy have an impact on this cancerous racket of fake currency? If the RBI continues to import paper and security ink for the new notes from the same foreign companies as Pakistan, then the new series will remain as __ (B) __ to counterfeiting as the older ones. Not unlike __ (C) __ who ultimately succeed in crawling into upgraded operating systems by __ (D) __their way through security updates, the __ (E) __ fake currency web is designed to survive structural disruptions — change of currency notes being one of them. Hence, the Indian government needs to do much more to permanently impair this hugely complex international trade, and in this case, regional cooperation is __ (F) __. Ironically, the __ (G) __ on financial terrorism (which was more of a “carpet bombing” campaign) can bear only limited dividends in the longer run as a standalone policy move — just like the Indian Army’s cross-border adventure of late September. 1. Which of the following words appropriately fits the blank labelled (A)? 2. Which of the following words appropriately fits the blank labelled (B)? 3. Which of the following words appropriately fits the blank labelled (C)? 4. Which of the following words appropriately fits the blank labelled (D)? 5. Which of the following words appropriately fits the blank labelled (E)? 6. Which of the following words appropriately fits the blank labelled (F)? 7. Which of the following words appropriately fits the blank labelled (G)? Directions (8 – 12): Fill in the blanks with the most appropriate word out of the five alternatives suggested below each question to make the sentence grammatically correct. 9. _____ you sit and finish your assignment _____ you leave. 10. She is ____ than her friends but not the _____ in her class. 11. Which airline flight _____ she traveling _____? 12. Don't turn _____ the TV. I _____ watching it. 1. Five friends scored marks in a test such that two of them had equal marks, while remaining three had one marks less than them. In total, they scored 312 marks. How many marks did each of the three friends who scored lesser have? 2. Pamela, Ricky and James completed a work together in 36 days and received a total payment of Rs. 54000. Pamela took half of the total money, Ricky took one third and James took remaining. In how many days, Pamela and James would have finished the work if Ricky was not working? 3. Tom deposited Rs. 15000 in a bank that gives a 10% rate of interest on simple interest. He kept the money in bank for 3 years and got some interest. How much money should he invest in compound interest at same rate so that the same amount of interest gets generated in 2 years? 4. Arun, Sujan and Sandip start running around a circular track and complete one round in 20, 28 and 36 seconds respectively. After how much time will the three meet again at the starting point if they all have started running at the same time? 6. You are given five digits, 2, 3, 5, 6 and 8. With the condition that a digit can be used at most twice in a number, how many five digit palindromes can be formed? 7. Amit, Bumrah and Chris started a business with investment in the ratio 5 : 6 : 8 respectively. After one year Chris withdrew 60% of his capital and Amit increased his capital by 60% of his investment. After two years in what ratio should the earned profit be distributed among Amit, Bumrah and Chris respectively? 8. The average weight of 15 tools in a box is 56 grams. If the weight of box is considered, then the average weight increases by 4 grams. What is the weight of the box? 9. An article is marked at Rs. 1500 and the shopkeeper allows three successive discounts of 20%, 10% and 10% respectively. Find the SP of the article. 1. B) Suppose the two friends who had equal marks in test got T marks each. Remaining three friends got one mark less. ⇒ Remaining three friends got (T-1) marks each. As per given information, they scored 312 marks in total. 2. B) Pamela, Ricky and James completed a work together in 36 days. Out of Rs. 5400, Pamela took half of the total money, Ricky took one third and James took remaining. The shares of Pamela, Ricky and James are in ratio (1/2):(1/3):(1-(1/2)-(1/3)), i.e., 3:2:1. Let us suppose that work done by Pamela, Ricky and James in one day is 3T, 2T and T, respectively. Let us suppose that when Pamela and James work together, they take N days to finish the work. ∴ When Pamela and James work together, they take 54 days to finish the work. 3. D) Money invested by Tom is Rs. 15000 for 3 years at 10% per annum in simple interest. Now, same interest is to be earned by investing some money in compound interest at same rate for 2 years. Let the money invested be Rs. T.
Money invested by Tom is Rs. T for 2 years at 10% per annum in compound interest. ∴ Rs. 21429 should be invested in compound interest to earn same amount of interest. 4. D) Arun, Sujan and Sandip start running around a circular track and complete one round in 20, 28 and 36 seconds respectively. 6. C) A palindrome is a pattern that is same when read from left to right or right to left. A five digit palindrome will be of the form ABCBA, where A, B and C are digits which may or may not be same, and A ≠ 0. In the given case, only possible digits allowed are 2, 3, 5, 6 and 8. None of the digits can occur more than twice. So, A ≠ B ≠ C.
A can be assigned any of 5 values. Then, B can be assigned any of remaining 4 values. Then, C can be assigned any of remaining 3 values. ∴ Total number of five digit palindromes can be formed = 5 × 4 × 3 = 60. 7. C) Let the capitals invested by Amit, Bumrah and Chris be 5x,6x and 8x respectively. Point M is 5 meters towards the North of Point L.
Point P is 10 meters towards the East of point M.
Point N is 6 meters towards the East of point L.
Point O is 11 meters towards the West of point N.
1. How far should one walk from Point L in order to reach point O? 2. If a person walks 5 m towards the South from point P and then walks after taking a right turn, which of the following points would he reach first? Directions (3 – 5): Read the following information carefully and answer the questions given below. i. Ajay is thinner and more intelligent than Tanvi but fatter and less intelligent than Surbhi. ii. Bhanu is thinner than cherry who is more intelligent as Tanvi. iii. The most intelligent is the fattest. iv. The least intelligent would be would be fourth if students sit in a line on a bench according to their weights and one started counting from the thinnest. 3. Who among them is thinnest? 4. Who is more intelligent than Tanvi but fatter than Surbhi? 5. Which of the following is definitely true? A) Bhanu is most intelligent in the group? B) Tanvi is the thinnest student in the group. C) Ajay is intelligent than Bhanu. D) Rekha is the fattest. 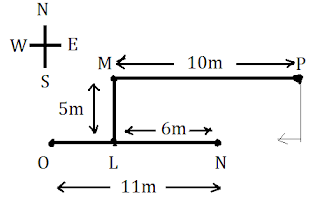 Directions (6 – 10): These questions are based on the data given below. Six captains of different cricket team – A through F are sitting in row facing the same direction. Each of them is a captain of different states among – Punjab, Delhi, Rajasthan, Maharashtra, MP and UP not necessarily in the given order. Each of them has a different lucky number among 21 through 26. A and C are not sitting at the extreme ends and also A is sitting three places away to the left of C. A is sitting adjacent to the person whose lucky number 26 who is not sitting at the extreme ends. The lucky number of the person who is captain of Delhi is not 25. C’s lucky number is not 23 and F is sitting at the extreme right. Captain of Rajasthan is sitting adjacent to A. The sum of the lucky numbers of C and B is 46. The sum of the lucky numbers of the captain of MP and C is 47 and they both are sitting adjacent to each other. The persons who is captain of Delhi and Maharashtra are sitting adjacent to each other. The sum of the lucky numbers of the persons who is captain of Maharashtra and Delhi is 48. The person who is captain of UP is sitting at the extreme left. B is three places away to the left of E.
6. In which position is E sitting from the extreme left? 7. Who is the captain of Punjab team? 9. Who is sitting two places away to the right of D? 10. Whose lucky number is 22? (3 – 5): As per given info. Intelligence: Starting from more intelligent to least. As no relation is given between Surbhi and Bhanu so we can’t predict the thinnest person. 1) Captain of Rajasthan is sitting adjacent to A. 2) A and C are not sitting at the extreme ends. 3) A is sitting three places away to the left of C.
Since A and C are not sitting on extreme end and A is 3 places left of C, thus A and C has to occupy positions 2 and 5 respectively. Thus captain of Rajasthan occupies either 1 or 3. 4) The person who is captain of UP is sitting at the extreme left, i.e. position 1. Thus the captain of Rajasthan is at position 3. 5) F is sitting at the extreme right. B is three places away to the left of E.
Thus F occupies position 6 and B and E has to occupy position 1 and 4 respectively. 6) The only left person is D and he occupies position 3. Thus D is the captain of team Rajasthan. 7) The sum of the lucky numbers of the captain of MP and C is 47 and they both are sitting adjacent to each other. 8) The persons who is captain of Delhi and Maharashtra are sitting adjacent to each other. Since only C has adjacent places vacant near him, he has to be either the captain of Delhi or Maharashtra and accordingly the captain of MP and that of either Delhi or Maharashtra will be positioned at position 4 and 6. 9) A is sitting adjacent to the person whose lucky number 26 who is not sitting at the extreme ends. Thus D lucky no is 26. 10) C’s lucky number is not 23. 11) The sum of the lucky numbers of C and B is 46. 12) The sum of the lucky numbers of the captain of MP and C is 47. The remaining lucky no are 21, 22, 23, 24, 25. Thus C can have 22, 24, 25 as his lucky no. 13) C is either the captain of Delhi or Maharashtra and sum of their lucky no is 48. If C‘s lucky no is 22 then lucky no 26 has to be of other captain of either Delhi or Maharashtra but lucky no 26 is already defined thus 22 is not possible. Again if C’s lucky no is 24 the other captain of Delhi or Maharashtra have to have 24 as his lucky no. That is not possible as well. Thus C‘s lucky no is 25. 14) The captain of Delhi’s lucky no is not 25, thus C is the captain of Maharashtra. 15) Captain of MP lucky no is 22 and captain of Delhi lucky no is 23. 16) Sum of lucky no of C and B is 46. Thus B’s lucky no is 21 and the remaining lucky no 24 belongs to A and A belongs to team Punjab.